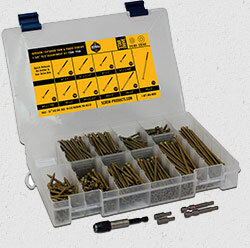 Star Drive Wood Screw Assortment Kits - Star Drive Wood Screws - Screw Products, Inc.Star Drive Wood Screws – Screw Products, Inc. 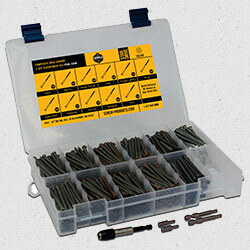 These economical and compact Wood Screw Assortment Kits are the perfect accessory for your home, garage or workshop. (They also make wonderful gifts!). Fully loaded, these take-anywhere kits are easy to carry, slim enough to fit just about any place you need and are available in several varieties for different purposes. 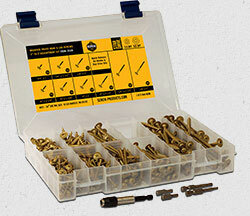 Our Assortment Kits include an assortment of our Star Drive Wood Screws in a specially priced package. Available in Composite Deck Screw, Finish & Trim Head, Cabinet / Finish, Trim Head, Interior Multi-purpose Gold, AC257 Compliant Exterior Bronze or Stainless Steel. Woodworkers, dads, moms, sisters, brothers, aunts & uncles, grandpa & grandma, your friends, contractors, deck builders, remodelers, roofers, plumbers, electricians, weekend warriors, do it yourselfers. Ages 5-120 years old. Anybody looking for a great screw!! 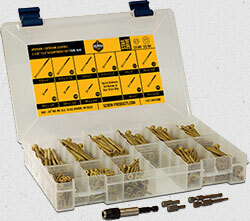 8 varieties of Star Drive Wood Screw Assortment Kits for specialized purposes. Adjustable Reusable Organizer – Easy to Carry! 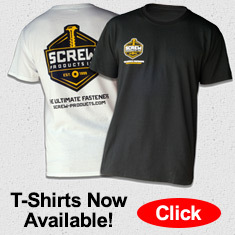 Perfect Accessory to your Home, Garage or Workshop – Great gifts! Includes Quick Release Magnetic Bit Holder. Includes Adjustable Organizer and FREE Drive Bits. 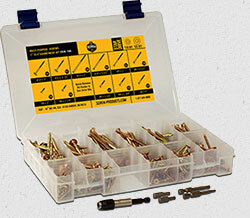 (BAK Shown) This economical and compact assortment kit is the perfect accessory for your home, garage or workshop. Fully loaded, this take-anywhere kit is easy enough to carry & slim enough to fit just about any place you need. The ultimate coated for exterior use screws! 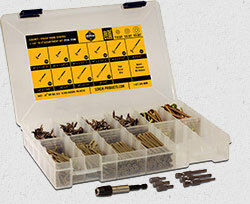 (TFAK Shown) This economical and compact assortment kit is the perfect accessory for your home, garage or workshop. Fully loaded, this take-anywhere kit is easy enough to carry & slim enough to fit just about any place you need. The ultimate trim & finish head head assortment kit. 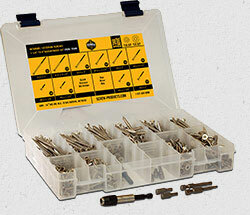 (CDAK Shown) This economical and compact assortment kit is the perfect accessory for your home, garage or workshop. Fully loaded, this take-anywhere kit is easy enough to carry & slim enough to fit just about any place you need. The ultimate trim head exterior use! 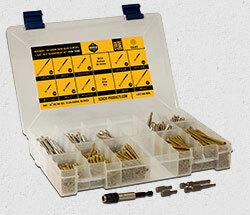 (CFAK Shown) This economical and compact assortment kit is the perfect accessory for your home, garage or workshop. Fully loaded, this take-anywhere kit is easy enough to carry & slim enough to fit just about any place you need. The ultimate in interior wood working!